It's a new day in the city, and rising along its main avenue, is the new name -- and new face -- of resort indulgence: Eighty-One Newport Boulevard. With its incomparable location, your address makes you the center of the action everyday. And here, where everything you need and desire under the sun comes together, your vibrant side truly comes alive. 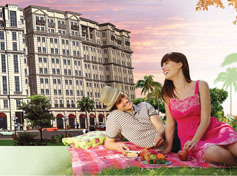 Nowhere is the have-it-all lifestyle more obvious than in your own 25-hectare Newport City. Forming its dynamic landscape are condominium communities, office buildings, hotels, retail hubs, leisure centers and modern conveniences -- all easily reached from your home at Eighty-One Newport Boulevard. When you have the run of a place this complete, there's nothing you can't do or enjoy. And with your quick link to the world outside, the possibilities are simply endless.